| Along with Folic Acid and Vitamin B6, it supports heart health by promoting healthy levels of homocysteine already within a normal range. 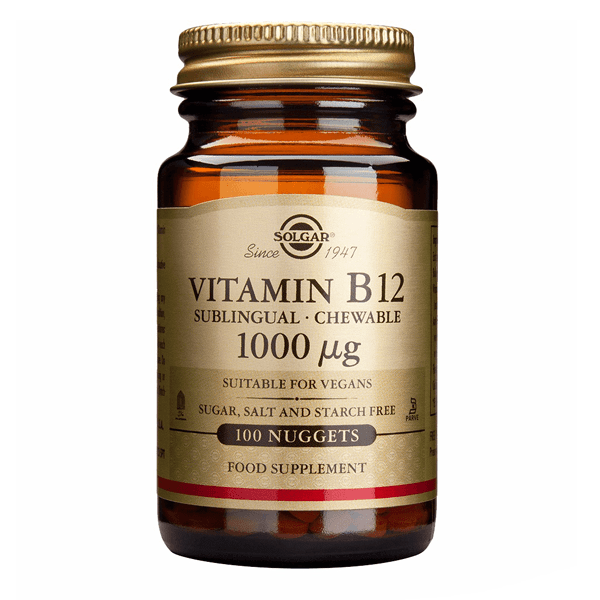 | B12 is required for the normal development and regeneration of red blood cells, which help to deliver oxygen throughout the body. Vitamin B12, or cobalamin, 1000 ?g Nuggets is a naturally occurring B-Complex vitamin in a sublingual form, that promotes the health of the circulatory and nervous systems and supports energy metabolism. As a food supplement for adults, one (1) nugget daily, preferably at mealtime, or as directed by a healthcare practitioner. May be placed between the cheek and gum or under the tongue and allowed to dissolve. Nugget may also be chewed or swallowed whole. Do not exceed directions for use. Vitamin B12 (as cyanocobalamin), mannitol, vegetable stearic acid, vegetable cellulose, natural cherry flavor with other natural flavors, vegetable magnesium stearate.